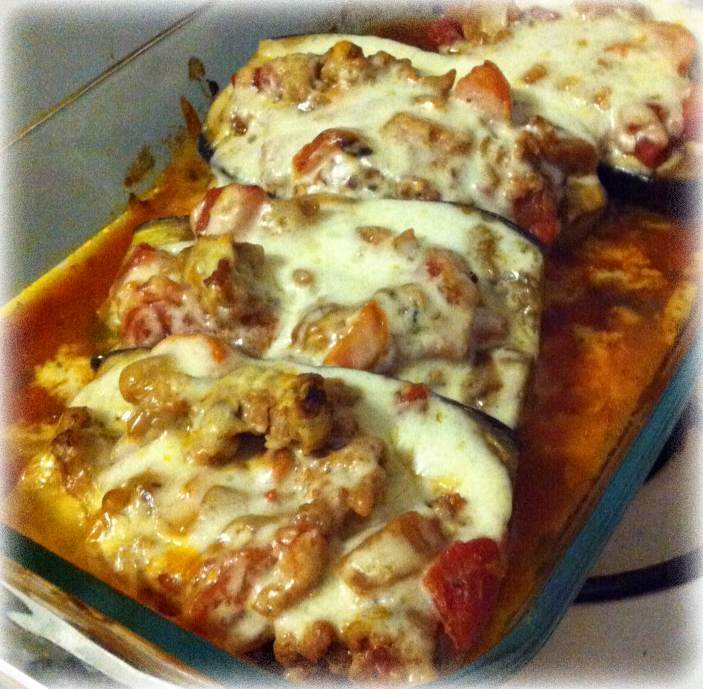 Halved eggplant with tomato sauce, cheese, and sausage stuffing. Disclaimer: I did not write this recipe, but I did edit the format. It is a guest blogger’s recipe and it does look tasty! Substitution: You can ignore the sausage altogether for a purely vegetarian dish. Makes 4 servings of 293 calories each. Eggplant: Cut the eggplants in half and sprinkle the tops with salt. Let them sit for 15-20 minutes. Rinse, and then scoop out some of the inside allowing for a place for the filling to rest, but save the insides for later on. Heat a small nonstick pan over medium heat with a drop of vegetable oil. Cook eggplant for 1 min on cut side and then remove and allow to cool. Filling: Heat a saute pan over medium head and add olive oil. Sautee carrot and onion for 5 minutes, until onion is translucent and carrot is soft. Add the sausage (removed from casings) and break it up as it cooks. Add the inside part of the eggplant saved after hollowing them out. Once sausage is cooked mostly through, add 1 can diced tomato and simmer for five minutes. Season to taste with salt and pepper. Baking: Preheat oven to 350. Place 1/2 cup tomato sauce in base of a baking dish. Place your eggplant cut side up into dish. Ladle your filling into the eggplant. Top evenly with cheese. Cover with foil and cook for 40 minutes or until eggplant is cooked through and cheese is melted. Enjoy!